This section covers the cargo services between Alderney and England which provided for the local industries which operated in the Island after the War and up to 1965. In the main these were small ex naval-vessels. As explained in the section covering services from Guernsey to Alderney and Sark, Alderney suffered great devastation during the Second World War. Whilst there was work to be undertaken on repairs to the houses and breakwater, there was little other work for many of the returning population, as the quarries did not re-open. To overcome this the British Government introduced certain measures aimed to get the Island back on its feet. These included the setting up a communal farm, initially to provide for the inhabitants, but soon the excess was being exported to England. The farm was also used to re-establishment of a cattle herd, also a pig farm, resulting in the establishment of a meat processing factory in 1951, Alderney Meat Products Ltd., which also processed meats imported from America. One of the main people behind the project was Michael Katz, who went on to own Scotts of Bletchley and turn it into a household name, and was credited with inventing honey-roast ham, Virginia ham (then a synonym for size and quality), and invented the technique of vacuum packed meats. The farm was operated by Maurice Crouch (Growers) Ltd., and they also developed into market gardening, including flowers, potatoes and other crops, and to help provide a wider range of employment, a small industrial factory was established manufacturing silencers for the motor trade in England, this was operated by Cheswick & Wright (Alderney) Ltd. The production of silencers for the motor trade required raw materials to be brought in, and the completed units to be exported, and for this a direct link to England was required. These local industries required a direct shipping link with England and over the next few years a number of small vessels were employed to provide this need, and some services continued on to Guernsey. One of the first on the scene was the Radcliffe Channel Islands Shipping Co. which in early 1948 placed DUNAVON on the route from Weymouth to Alderney and Guernsey, and she was replaced in August that year by the larger passenger / cargo RADFORD. 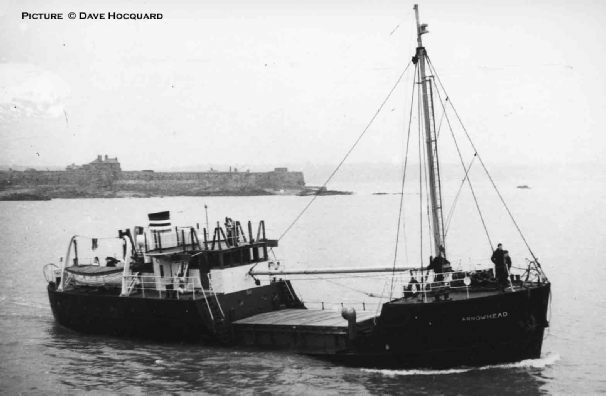 When Radcliffe failed in December 1949, a Mr. Williams set up Arrow Channel Islands & Coast Lines Ltd., and in January 1950 chartered ARROWHEAD from the Ministry of Transport and placed her on the Weymouth route. With the States of Alderney refusing to grant him a monopoly operation, the service was withdrawn in June, and the vessel returned to the Ministry, but she returned in December that year on charter to Commodore Cruises Ltd., to replace ISLAND COMMODORE on the Sark and Alderney service. which she did until July 25 1951, she then remained in the area until late November when she again went off charter. At this time the new Inter - Island monopoly shipping laws were being introduced, and part of that was the “sale” of the Island Shipping Co Ltd to Mr. Charles Barnett, the company being used to provide the bulk cargo and charter needs of the islands. The cross channel needs of Alderney’s enterprises were also growing, and ARROWHEAD was again chartered from April 1952. The local industries grew steadily, helped by the decontrolling of potato imports into England in 1950, and the removal of controls for the import of meat into the country, due to a dispute with one of England’s main suppliers Argentina, but food was still rationed until 1954. To cater for this growth, in July 1954 the Island Shipping Co. commenced a regular service from Portsmouth to the Alderney, Guernsey and Jersey. The service was extended in December that year using chartered tonnage, and in February 1955 the company purchased CHANNEL TRADER, another Torpedo Recovery Vessel. 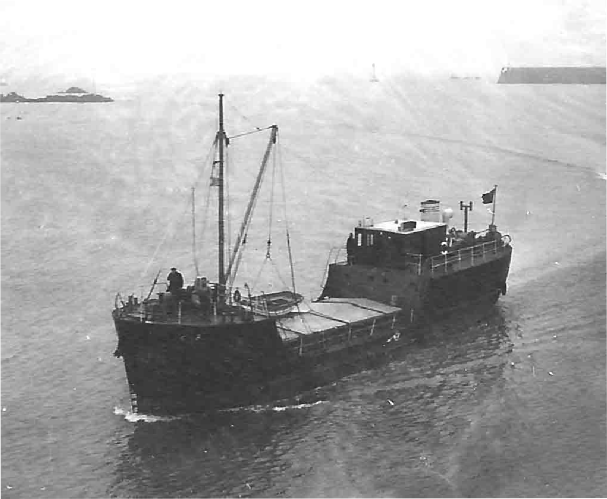 The service suffered a setback in February 1956 when ARROWHEAD was lost, but she was quickly replaced by the chartered SNIDER, and in April that year the service was taken over by the Alderney Tramp Shipping Co. Ltd. who acquired the vessels, though Island Shipping continued to operate them. 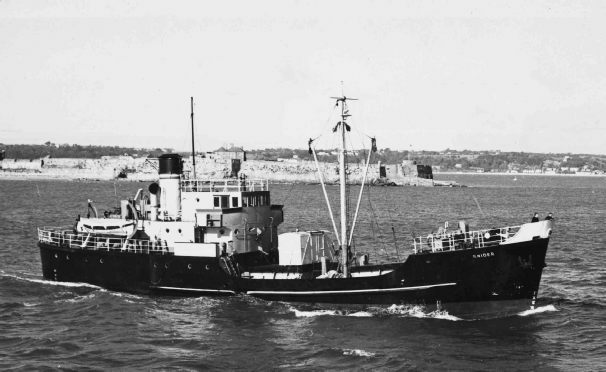 Alderney Tramp Shipping Co. Ltd. had been formed in 1953, with Commander S. P. Herivel being a principle, and in April 1956 the company increased its capital with Mr. C. A. Aeschiman joining the Board. 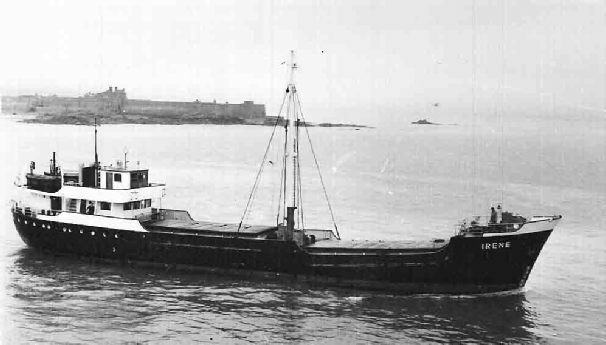 SNIDER returned to service from a refit in July that year with a refrigerated hold installed, to cope with the meat exports of Alderney Meat Products, and at the same time the service was increased to twice a week, but the vessel suffered boiler problems in January 1957 and was withdrawn, and with her went the refrigerated service. Such was the expansion of farming in Alderney, that HASLEMERE transported 91 head of cattle from Guernsey to the Island in March 1958, and a week later the entire heard of Commander W. A. J. Campbell was taken by ISLAND COMMODORE from Sark to Alderney. HASLEMERE arriving Alderney in March 1958 with 91 head of cattle from Guernsey. The latter part of the 1950’s and early 1960’s was to be the peak time of the small vessels on the route, as by now operating costs were increasing, and there was increased competition from farms in England, where increased production was being achieved by removing hedgerows which allowed increased production by using large mechanical units, and this also reduced unit costs. Meat production was also being increased using volume methods, initially with chickens but this quickly spread to beef and pork production. In 1957 CHANNEL TRADER was working the Portsmouth - Channel Islands service, but as traffic grew, chartered tonnage was introduced early in 1958 with one vessel IRENE working from April to May 1960 with only a few breaks. HOC VINCES was another, on the route from February to December 1959. The use of larger vessels, and calling at all the islands, meant that there was a lesser service for the needs of the local industries, and craft such large ex trawlers were introduced. In November 1959 Messrs Cheswick & Wright (Alderney) Ltd acquired such a craft and renamed her AUDAL, to provide their transport requirements, and they also carried exports of flowers and vegetables, the skipper being Mr. J. W. Carre of Sark. Another large ex trawler operating at this time was JOLLY GAMBLER, owned by Mr. F. Morton, and she passed to Motor Vessels (Alderney) 1960 Ltd. in July 1961 and was renamed AUDAL II. 1956 July SNIDER leaves Alderney for the first time with chilled meat, and AUDAL in use shipping car silencers and empty gas cylinders. 1960 February AUDAL vessel taking motor silencers, flowers, broccoli and seed potatoes, empty gas cylinders to Portsmouth for the Alderney Livestock Co. Ltd., which undertakes growing. The company has exported 2 million daffodils this year, and broccoli exports are going well. 1960 April C8 arrives with 41.5 tons of potato boxes and lime, next trip arrives from Portsmouth with 19 tons of general cargo. AUDAL made 6 inward and outward trips with the usual cargos especially broccoli. 1960 May AUDAL to Portsmouth with radishes, broccoli, and silencers, and inwards with gas cylinders, and components for silencers. 1960 June JOLLY GAMBLER arrived in Alderney from Portsmouth, sailed to Rotterdam. 1962 January SAINT ERNEST lost. Alderney Tramp Sg Co’s CHANNEL TRADER went ashore on the French coast in May 1959, but the service continued to grow using chartered tonnage, and in February 1960 she was replaced in the fleet by RIDUNIAN, and then in June a sister company Hazley Ltd purchased ORSELINA, these replacing chartered tonnage. If the development of the general cargo service from Portsmouth to the Islands had seen a change in the services for Alderney, then the purchase of Commodore Shipping on July 1 1960 by Guernsey resident Mr. Mansfield Markham was to have lasting effects for all the Channel Islands, as he gradually took over most of the other local and cross channel shipping operations. Alderney’s industries were flourishing at this time and as mentioned a number of those returning from England after the War when they saw the state of the Island, decided not to remain, thus the island was suffering from a lack of labour, and to overcome this, Italian workers were recruited, the first arriving late in 1959, with a further twenty arriving in January 1960. The last of the small vessels to enter the trade in this period was SAINT ERNEST which was purchased in October 1960 by the Alderney company Allen Shipping Ltd., which had been formed in October 1960, and she trading mainly to Portsmouth and Newhaven from the island. 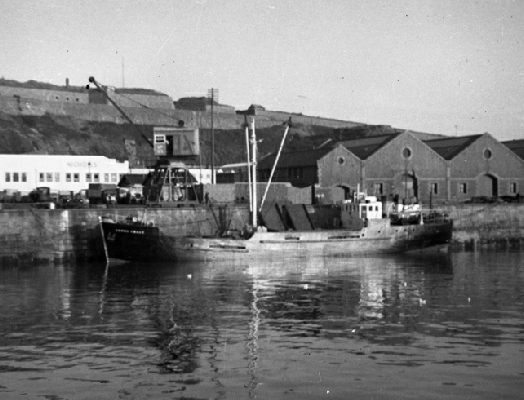 The light industry in Alderney continued to expand, resulting in the companies requesting more foreign workers, but late in 1961 the Transport and Harbours Committee refused any further applications for work permits for foreign labour. This had an immediate effect, with the Alderney Meat Products Ltd. closed their factory at the end of the year. It was from this point that the island’s industries went into decline. On October 4 1961 came the first expansion step of Commodore Shipping in the Channel Islands shipping. On that day a press release stated - “that the Company in association with others are hoping to start a new Guernsey - Jersey- Alderney - United Kingdom shipping service shortly. The service for passengers and cargo will operate between the islands and Portsmouth and Newhaven. In agreement with Mr. and Mrs. N. J. Allen of Alderney, owners of SAINT ERNEST, who already operate between Portsmouth and Alderney. Commodore Shipping are to use a new ship of about 300 tons, which can also carry 12 passengers. Before this could take place, two vessels were lost. The first was the tragic loss in January 1962 of SAINT ERNEST with all her crew, when she was on a voyage from Alderney to Newhaven, those lost included two sons of the owners Mr. & Mrs. Allen. Two months later RIDUNIAN sank after hitting a reef in dense fog, shortly after departing Alderney bound for Guernsey. In this case her crew had a lucky escape and were all saved. It was against this background that Commodore Shipping purchased Alderney Tramp Shipping Co. Ltd., in March 1962, and took ORSELINA on a three year charter. The vessel mentioned in the October 4 1961 press release arrived in July 1962, being registered to the Allen Sg co. and named ALLEN COMMODORE as a mark of respect to the family. The final major blow for Alderney’s industries came on February 7 1963 when it was announced that the motor car accessory works of Cheswick & Wright (Alderney) Ltd. were to close down by the end of March, 40 men and women on the payroll were to be un-employed . The company had been taken over by Leon M. Berner Ltd., In January 1962, and the manufacturing side of the company was to be moved to the Birmingham works of Belliss & Morcom Ltd., who were acquiring an interest in the Alderney company. The severity of this closure to the northern isle which has a population of around 1,500, could not be overstated, as meant it will adversely affect the economy of Alderney. With the both the meat and silencer factories having closed, and continual reduction in the agriculture exports as English producers met the country’s requirements and this coupled with the subsidised Foreign imports starting to appear at prices at which Alderney with its labour and transport costs could not complete. The final straw in food production in Alderney was the introduction in England of the 1964 Resale Prices Act, which allowed retailers to charge what they liked for their goods. This resulted in the creation of the supermarket which drove down the wholesale prices, which saw the demise of many small producers and also many small corner stores. The flower industry suffered the same fate, as did those in the Scilly Isles. 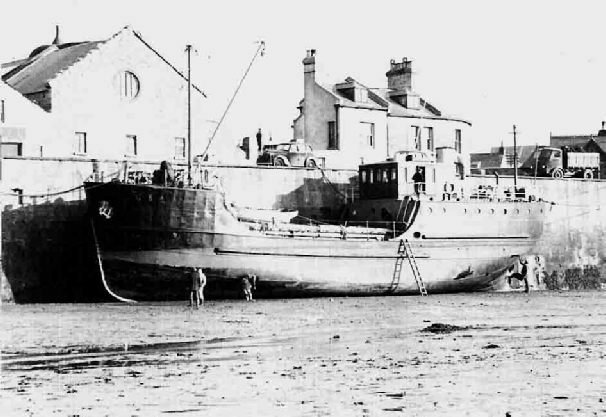 With no demand for a direct bespoke small cargo ship service from Alderney to England, the needs of the Island were then met as part of the Commodore network. The situation remained more or less static until January 1969 when a group of six Alderney businessmen decided to form Alderney Shipping Co. Ltd. to import building materials directly from England, and their ALDERNEY TRADER commenced service in February. In May of that year a further company Link Services Ltd. was formed by Alderney residents, and a small Dutch coaster REIGER was purchased in September 1969. In early 1969 Commodore Shipping announced that they would not be seeking to retain the “Monopoly” service from Guernsey to the Islands. Sark decided to set up their own operation, leaving Alderney to decide how to proceed. As mentioned the passenger needs of Alderney were being met by the airlines, thus all that was required was cargo service from Guernsey. At a meeting of the States of Alderney on September 20 1969, it was decided to award the licence to Alderney Shipping Co Ltd. and they took over the provision of the cargo service on October 1 1969, but the sting in the tail was that the rates were 50% above those that had been charged by Commodore. Shortly after commencing the contract there was a downturn in construction on the Island and Alderney Shipping struggled financially, resulting in an increase in company capital from £10,000 to £30,000 in July 1970. To help maintain the “contract” service REIGER now renamed ALDERNEY COURIER was chartered, and by January 1971 the sole owner of Alderney Shipping was Mr. J. F. W. Main. With continued financial difficulties the capital was further increased in July 1973, and the company was acquired by Link Services Ltd. 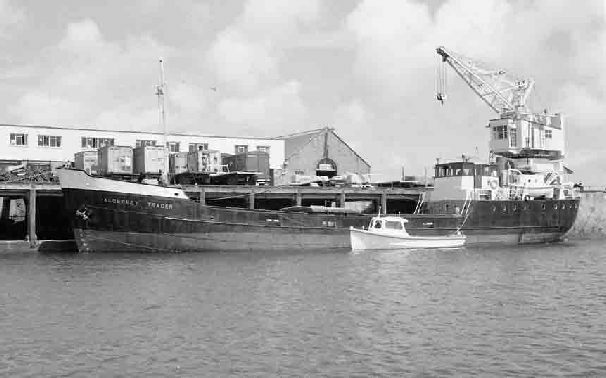 Immediately ALDERNEY TRADER was sold, and ALDERNEY COURIER was “sold” by Link Services to the Alderney Shipping Co. in 1977 and sold out of the company a year later. Alderney Shipping Co. Ltd., still operate the monopoly contract between the Island and Guernsey and include it in service from Poole which also takes in Jersey. - Radcliffe Channel Islands Shipping Co. The company was owned by Mr. William Radcliffe Metcalf who used one of his Christian names for the title of the company. 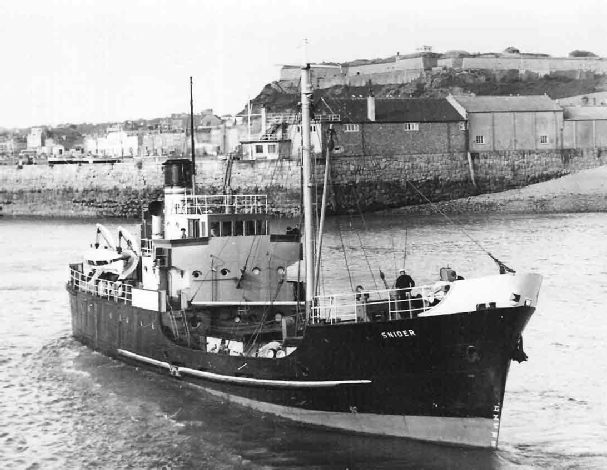 One of the first ships to provide a link was DUNAVON which commenced on Alderney run in early 1948. Being replaced in August 1948 by the former minesweeper RADFORD onto the Weymouth / Alderney / Guernsey route. The company failed in December 1949, leaving both Alderney and Sark without a supply link - see main section for full details. 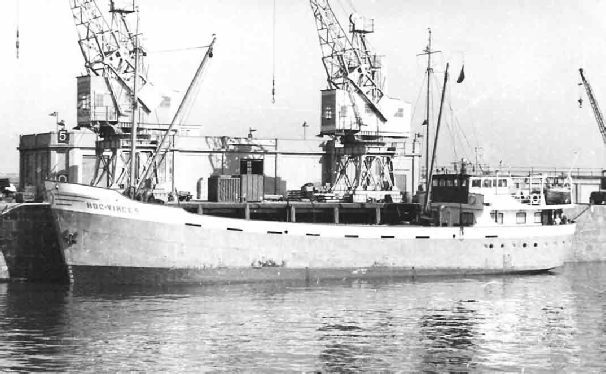 The Company was the parent of Island Shipping Co. Ltd., and when that ceased trading in November 1948 leaving the Islands without services, B.C.I.Sg stepped in and used their small CORAL QUEEN to provide a cargo link with Alderney. 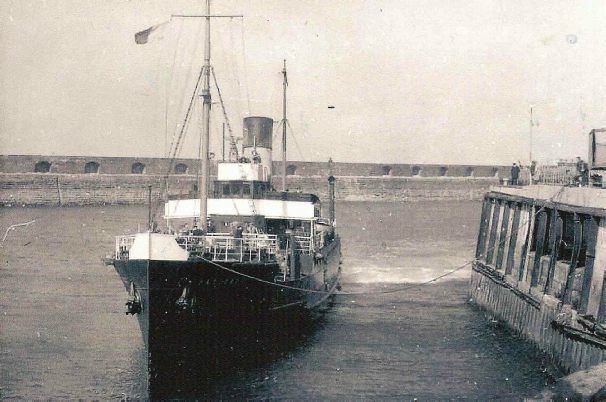 The Company also provided an emergency service to Alderney in 1950 when Radcliffe Channel Islands Sg failed. B.C.I.S. continued to call at Alderney with cargoes of bricks, cement, fertilizer and other materials from England for many years. The Guernsey office of the Company became Managers for Commodore Shipping Ltd in 1952. The company was set up by Mr. Williams to take over the service between Weymouth, Alderney and Guernsey, following the collapse of the Radcliffe Company. The company chartered the Torpedo Recovery Vessel T.R.V. 8 from the Ministry of Transport, renamed her ARROWHEAD, and she arrived in Guernsey for the first time on January 14 1950. Alderney unlike Sark were not prepared to grant a monopoly operation to the company, thus they withdrew in June 1950 leaving the Island without any service. Her last trip was on June 16. The company as we have seen was a subsidiary of the British Channel Islands Shipping Co. Ltd., and following introduction of the new monopoly laws in 1951 the company was "sold" to Mr. Charles Barnett and used as a base to provide the bulk cargo and charter needs of the islands, with the ARROWHEAD being chartered from April 1952. The following year a substantial number of shares (£12,000) were acquired by a Jersey resident and also a Alderney company, this reflecting the "channel islands" nature of the operation. 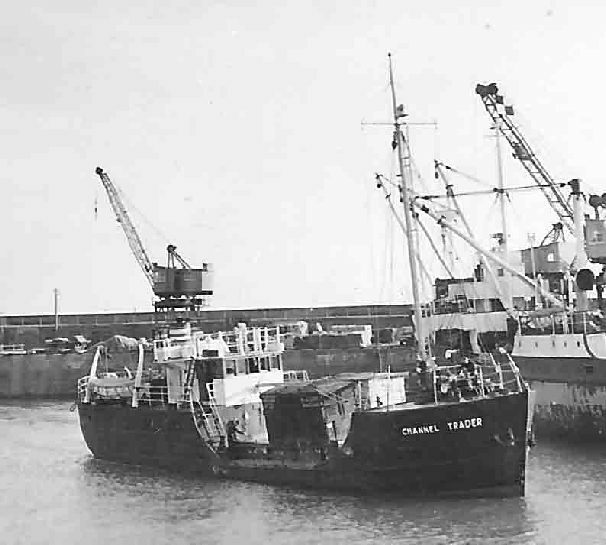 The company introduced a regular cargo service between Portsmouth, Alderney, Guernsey and Jersey in July 1954 and this was expanded in December that year, with CHANNEL TRADER joining the fleet early in 1955. 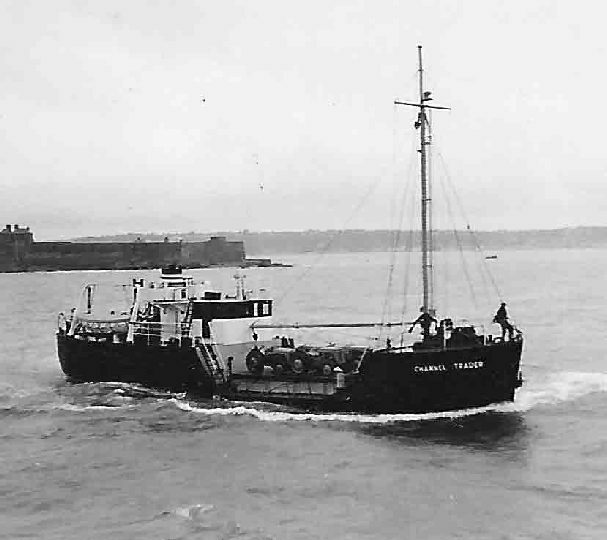 The year 1956 was to be a time of change, firstly with the loss in February of the ARROWHEAD (which was replaced by the chartered SNIDER), and then in April the cargo service was taken over by the Alderney Tramp Shipping Co. Ltd. who purchased CHANNEL TRADER from the Island Shipping Co.Ltd. though that company continued to operate the ships. Further changes in Channel Islands shipping occurred in 1960, one of these being the Alderney company taking full control of their operations and though the Island Shipping Co. continued, it did not trade as a shipping company, and was dissolved by order on August 8 1967. ARROWHEAD 4.1952 - lost 2.1956. The company was registered in Alderney on April 25 1953, having offices at 9 Victoria Street, Alderney, and the Manager being L. S. Devonport, Greenlands, St. Peter Port. The Directors at August 4 1953 were S. P. Herivel, Elizabeth Rothery, Roderick Le Masurier , with the main shareholder being. Alderney Whaling Co. The capital was increased on 1956 13 April, with Alderney Whaling Co. now holding 5000 shares, C. A. Aeschiman 5000 and the Island Trust. 5000, and by January 1958 Island Trust held 10,000 shares, with no Alderney Whaling shares. It was at this time that the company took over the service from Portsmouth to the Islands, purchasing CHANNEL TRADER and taking over the charter of SNIDER. The service continued by using CHANNEL TRADER alone after SNIDER failed in January 1957, and in January 1958 the company commenced chartering vessels for the service. Things changed in 1960, when C8 / RIDUNIAN was purchased in February, and EBBRIX / ORSELINA purchased in June. These vessels maintained the service until March 1962 when Commodore Shipping took the operation over. RIDUNIAN was lost at this time, and ORSELINA went on charter to Commodore. Mr Charles Alexander Aeschimann was a resident of Guernsey living at Hazely Manor, Rohais, after which Hazley Ltd was named. Hazley Ltd., was registered in Guernsey on December 9 1927, and were wines and spirits importers and retailers. ORSELINA was registered to that company, and was named after a municipality in Switzerland. The owner also had a property in Jersey. Mr Aeschiman remained a shareholder until 1970, and the company was removed by letter dated June 29 1982. The company was registered in Alderney on November 18 1960 with Mr. N. J. Allen being the main shareholder. SAINT ERNEST was registered to the company in October 1960, and it was a tragic loss when the vessel was lost with her crew in January 1961, two of whom were sons of the owners. As a tribute to the family Commodore Shipping named their next vessel ALLEN COMMODORE and registered her to the company. On September 14 1970 it was decided to wind the company up, and this occurred on October 2. The company was registered in Alderney on January 24 1969 by a group of six local businessmen for the purpose of importing building materials directly from England. Initially each held 1,000 shares, they were John Chapman A. G. Harding, P. Blake, D. E. Poulton and J. F. W. Main. The company commenced operations in February that year, and having purchased ALDERNEY TRADER began a cargo service from Poole. When Commodore Shipping announced that they would not seek renew their Inter-Island contract when it became due at the end of September 1969, Alderney Shipping made a bid to provide a cargo service from Guernsey. At their meeting on September 20 1969 the States of Alderney awarded the licence Alderney Shipping Co Ltd., but the sting in the tail was that the rates were 50% above those charged by Commodore Shipping. 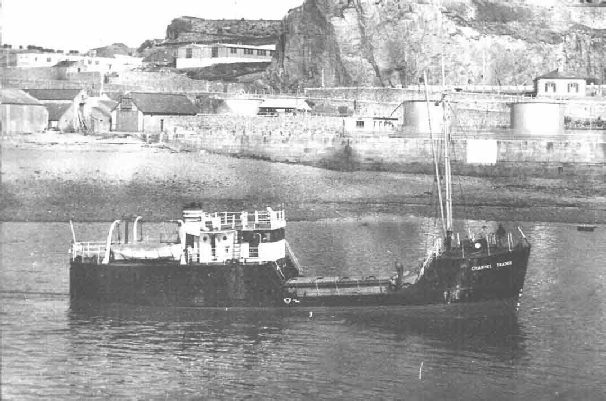 No sooner had the company started trading in February 1969, than there was a downturn in construction in the Island, and Alderney Shipping struggled financially, resulting in an increase in company capital from £10,000 to £30,000 in July 1970, and by January 1971 the sole owner was Mr. J. F. W. Main. To help maintain the “contract” service ALDERNEY COURIER was chartered from Link Services, but with continued financial difficulties the capital was further increased in July 1973, and the company was acquired by Link Services Ltd., with Jon Kay-Mouat as its principle, and immediately ALDERNEY TRADER was sold. Link Line “sold” ALDERNEY COURIER to the Alderney Shipping Co. in 1977 and she was sold out of the company a year later. The Company was registered in Alderney on May 21 1969, having offices at 37 High Street. The main share holders were Felix Holdings Ltd. 500 shares, Gordon Horace Buckie 500 shares, and Jon Kay-Mouat 1000 shares. The company purchased a small Dutch coaster, and commenced trading in the Channel Islands area. Alderney Shipping continued to struggle, resulting that in July 1973, the company was acquired by Link Services Ltd., but as the contract was in the name of Alderney Shipping, that company was used, with Jon Kay-Mouat as its principal owner. 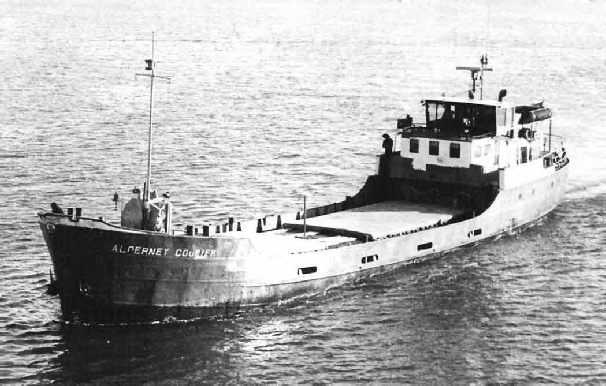 ALDERNEY COURIER was ”sold” to Alderney Shipping in 1977. A number of the vessels were chartered and or bought from the Government, and the details shown in italics come from official Ministry of Transport records. Operators Arrow Channel Islands & Coast Lines. This vessel had three periods on charter from the Ministry for use in the Islands, and are covered in the separate sections below. The vessel was registered as ARROWHEAD in London on January 14 1950, to the Minister of Transport, her manager being Mr. Gerald Christopher Judd, Berkley House, Hay Hill, London W1. She was chartered to Arrow Channel Islands & Coast Lines, to operate from Weymouth to Alderney and Guernsey, and her first arrival at Guernsey was on January 14 1950 with her agent being Chapple, and by March her agent was Arrow Channel Islands & Coast Lines. When Alderney would not grant a monopoly operation, the company pulled out, with her last trip to Guernsey being on June 16, and she was then returned to the Ministry. 1950 06 December to 01 December 1951 Chartered to Commodore Cruises Ltd. The ship was back in Guernsey in December 8 1950, being chartered to Commodore Cruises Ltd. to replace ISLAND COMMODORE which had to return to England, and management was transferred on December 11 to Mr. Charles Barnett, Commodore Cruises Ltd., 2 Terminus Road, Eastbourne. She maintained the Sark / Alderney service until July 25 1951, and then remained in the Islands until November 24 1951, before again returning to England. 1952 06 April to 06 August 1955. Chartered to Island Shipping Co. Ltd.
1955 06 August. Sold to Mr. Charles Barnett. The ship was back in Guernsey on April 4 1952 when she commenced a charter to Island Shipping Co. Ltd. By a Bill of Sale of August 17 1955 the vessel was sold to Mr. Charles Barnett, 36 Napier Court, Hurlingham, London SW6., and he was appointed manager on September 1. Just over a year later on December 22 1955 the vessel was “sold” to Island Shipping Co. Ltd., 26 Glategny Esplanade, St. Peter Port, and two days later the port of registry was transferred to Guernsey. The ship hit the headlines a couple of times, the first on September 27 1954 when it was reported that she had struck a submerged object off Demie des Pas, Jersey, and on November 4 1955 she suffered engine trouble 30 miles NNE of Platte Fougere, and had to be towed in by CHANNEL TRADER. Just over a month later on February 2 1956 ARROWHEAD went ashore near Mear Rocks, Exmouth Bar. She was refloated on February 13 and taken until Exmouth, but did not return to service. On August 20 1956 she was registered to Lionel Cook, and in the MNL of 1957 the Managing owner is given as Lionel Cook, 37 River Road, Littlehampton. ARROWHEAD seen at No. 4 Berth in St. Helier Harbour. 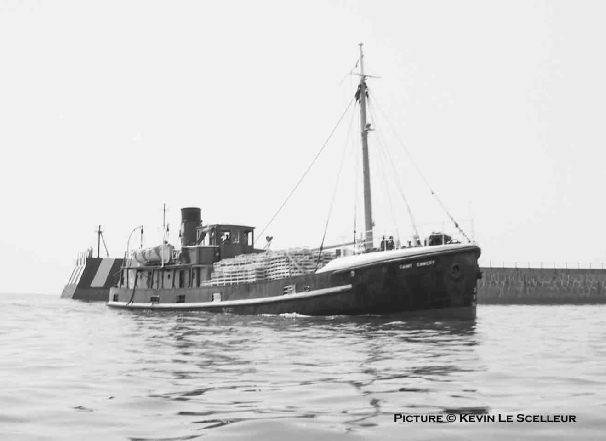 Vessel arriving St. Helier on January 7 1956, just a month before she was lost. Note the additional coloured bands on the funnel compared with the picture above. Owner Island Shipping Company Ltd.
Alderney Tramp Shipping Co. Ltd.
1955 2 February. Sold to Island Shipping Company Ltd. The ship was arrested in Portsmouth on December 7 1956 due to a debt of £3,727 to Island Shipping Company (Guernsey) who operated the vessel. The arrest was lifted on December 11 after bail of £4,000 was lodged. On May 20 1959 the ship reported that she was ashore on the north tip of Burhou, but in fact she was found ashore 2 miles on the east side of Cap de la Hague, under the red light tower. The vessel was re-floated and towed into Cherbourg, but was beyond repair and scrapped. She was on voyage to Alderney from Portsmouth. Approaching the pier heads at Jersey. CHANNEL TRADER departing the West Cross berth in Jersey March 1957. Operator Alderney Tramp Shipping Company Ltd. Built as a Naval Armaments Vessel. 1956 15 February to 28 August 1957 vessel chartered from Secretary of the Admiralty by Alderney Tramp Shipping Company Ltd.
Chartered in 1956 to replace ARROWHEAD, the vessel arrived in Jersey for the first time on February 26 and ran a once a week service until June when she went to refit. She re-entered service on July 17, now with the installation of a refrigerated hold, and the service then became twice weekly. By October 23 1956 her funnel colours had been altered with the company house flag replacing the coloured bands. Her last visit to Jersey was on January 2 1957 and due to boiled problems was laid-up in St. Peter Port for ten weeks before being towed to St. Sampson’s where she was hauled out of the water, and spent a number of months there before being returned to the Navy. She did return at least once to Alderney, when on February 6 1960 she arrived from Chatham on dumping operations. She was refitted by the Navy in 1963, and on May 27 1964 was advertised for sale in Lloyds List. In a letter dated December 22 1964, Solent Power Units stated that the vessel had been sold to Mr. Hummeldsond of Bergen. Lloyds List movements showed that tug SNIDER sailed from Southampton on June 19 1965 with CITY OF WATERFORD in tow, bound for Stravanger. The vessel was renamed VESTERVAG, converted into a motor vessel, but was lost on December 24 1971, 14 miles southwest of Lista Lighthouse. SNIDER photographed in the first few days in service, before her re-paint. Vessel pictured after her refit. SNIDER inbound to St. Helier. Note by October 23 1956 the company house flag had replaced the coloured bands on the funnel. 1959 November. Vessel ex UNITED FRIENDS registered in Guernsey, for use by Messrs Cheswick & Wright (Alderney) Ltd to transport materials for their factory. Skipper Mr. J. W. Carre of Sark. 1959 November 27. Arrived Alderney. 1960 18 February. Vessel taking motor silencers, flowers, broccoli and seed potatoes to Portsmouth. Owner Auiragay Shipping Company, Weymouth. 1960 March. Vessel has replaced ISLAND COMMODORE during overhaul. 1960 July 18. JOLLY GAMBLER has passed from the ownership of Mr. F. Morton to Motor Vessels (Alderney) 1960 Ltd. Vessel is to be renamed AUDAL II. 1961 18 February. Vessel aground at Woody Bay, Nr Ventnor. Owner Alderney Tramp Shipping Company Ltd. Propulsion Single screw, 5cyl oil engine. The vessel was built as a Naval Store Ship, the design being copied for the later Torpedo Recovery Vessels. C8 arrived in St. Sampson’s 15:45 hrs on January 25 1960 with her owner Captain P. M. Herbert, together with Capt. G. Hocquard and engineer Mr. A. J. Niles from Guernsey. The vessel had left Hayle on Wednesday 20, and called at Falmouth and Plymouth. After inspection the vessel was purchased by Alderney Tramp Shipping Company Ltd., being registered to them in Guernsey on February 27 1960. On March 10 1960 an official notice appeared in Lloyds List from the publicity officer Charles Alexander Aeschimann of Hazely Manor, Rohais, Guernsey, to rename C8 to RIDUNIAN. On 187731 181.83grt 65.91nrt. The previous owner was P. M. Herbert, Bude. Signed as owned by A.T. Sg Co. Ltd. The vessel traded in the Channel Islands area, but only for two years, as on March 28 1962, RIDUNIAN sailed from Alderney at 18:45 hrs in thick fog, with a cargo of gravel and sand bound for Guernsey. Forty minutes later she struck a reef, and as she was badly holed the crew took to the liferaft. Later they tried to re-board the vessel but they were unable to do so. She was last seen drifting in a south west direction and sinking fast. The crew were picked up by the Trinity House tender BURHOU. The vessel was on charter to Commodore Sg. C8 was built in 1940 as a naval store ship, and during the War was in service on the Clyde, afterwards being laid-up. In 1958 she was acquired by Capt. P. Herbert of Bude, Cornwall and traded in the Bristol Channel area, and was noted on August 8 1958 sailing from Padstow for Ilfracombe. C8 arriving St. Helier March 8 1960. C8 on the hard at St. Sampsons, short;y after arriving in Guernsey. Propulsion 1 x MWM 4cyl oil engine. EBBRIX was purchased on May 27 1960 by Hazley Ltd., and made her first call at Jersey on June 1 1960. She was registered in Guernsey on July 9 as EBBRIX, though the company state that she was renamed ORSELINA on June 28, she made her first to Jersey as ORSELINA on June 23. The ship was registered under the name ORSELINA in Guernsey on July 18, the name due to the owners close connection with the canton in Switzaland. Two years later in March 1962, the Portsmouth service was taken over by Commodore Shipping, and ORSELINA was taken on a three year charter by the new operator. 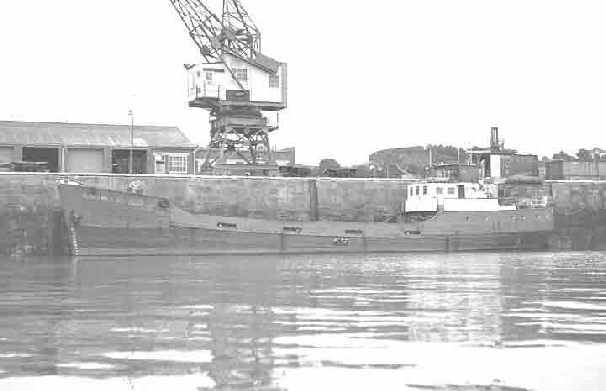 The vessel remained in their service until June 6 1965 when she sailed from St. Peter Port for Dieppe to collect a cargo of timber for the Thames, having been purchased by Continental Cargo Ltd., Rochford, Essex. It would appear that a year later, she was sold to Burry Sand Company Ltd., and on in November 1972 work started in breaking the vessel up at Llanelle by Isaac Jones. 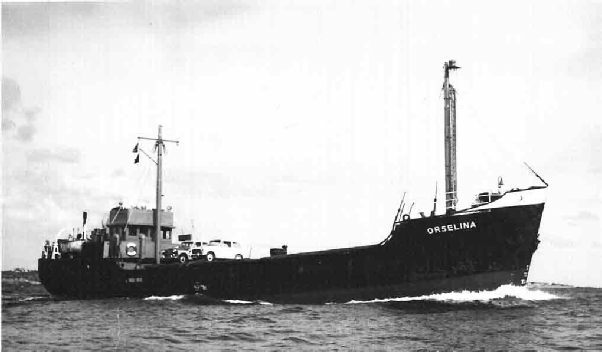 ORSELINA outward bound from Jersey August 19 1960. Owner Allen Shipping Line Ltd. The ship was acquired for use in the Channel Islands area in October 1960, being first registered in Guernsey to Mr.John William Carre of Sark on October 3. The vessel was re-registered to Mr. N. J. Allen of Alderney ten days later on October 13, and commenced trading mainly out of Alderney to Portsmouth and Newhaven transporting the islands export crops, but she also from Guernsey and a few from Jersey. On November 17 1961 the newspapers stated that the ship had completed her first year in service and had undergone a refit, including the fitting of two new six cylinder Gleniffer 120 HP engines. 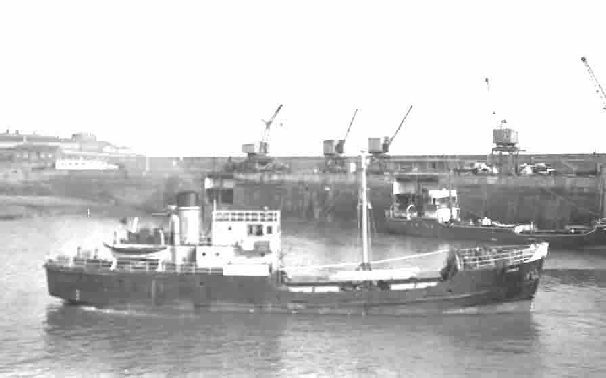 Tragedy befall the ship on the night of January 18/19 1962, when after departing Alderney with a cargo of five tons of broccoli bound for Newhaven, she failed to arrive. Her crew of five were lost, including two sons of the owners, and the master Captain J. Carre. It was stated at the time that the vessel was on charter to Commodore Shipping. The vessel was built in 1936 as ARRAN MAIL for the Caledonian Steam Packet Co. Ltd., (London, Midland & Scottish Railway), passing to the British Transport Commission in 1948. She was sold in 1951 to Mrs. Honnilow, being renamed SAINT ERNEST in 1954. The Lloyds Register for 1954/55 gives the owner as Mrs. F. Hamilton, and in the 1955/56 edition the owners are Serra Bros Ltd., Gibraltar., and was the same for LR 59/60. SAINT ERNEST seen passing the end of the Elizabeth Castle breakwater when arriving St. Helier on June 21 1961, loaded with cauliflower crates. Owner : Alderney Shipping Co. Ltd.
1969 27 February. Sailed Dublin as ALDERNEY TRADER, having been acquired by Alderney Shipping Co. Ltd.
1973 July. Sold and renamed MEMI. 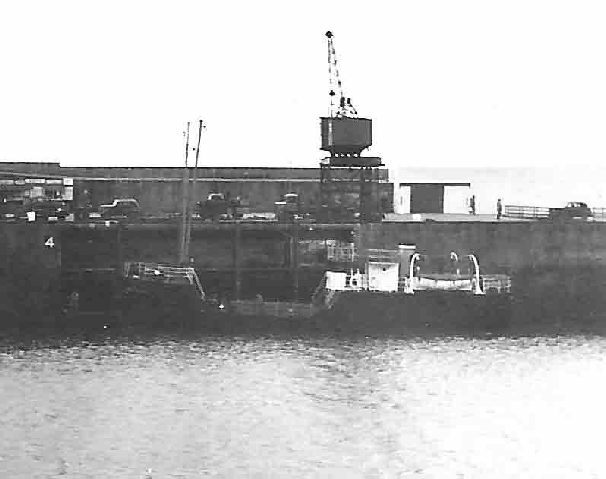 1978 Converted into a pontoon for use at St.Malo. 1952 Built as LADY SYLVIA. ALDERNEY TRADER seen alongside in St. Peter Port 28 July 1971. The vessel was acquired in mid 1969, and was initially registered in Jersey. In March 1970 her port of registry was moved to Guernsey and the vessel renamed ALDERNEY COURIER, sailing from Guernsey as such on March 26. 1977 By Link Services Ltd., to Alderney Shipping Co. Ltd.
1978 19 October. Sailed St. Sampsons for Grenada. Another view of the vessel. 1977 From Link Services Ltd. to Alderney Shipping Co. Ltd.
Two of the charter ships which ran the service in 1958 / 1960. IRENE arriving St. Helier March 11 1960. HOC VINCES at the No. 5 berth in St. Peter Port.